1. Plan of Action - The first thing to do while job search Philippines is to have a plan of action ready. The primary thing is to know what type of jobs you are looking for. The next step is to find the relevant job opening that matches your qualifications. For this look the company sites or the numerous job portals or attend the job fairs or look at the newspaper classifieds. 2. Online Presence - You have crafted a unique resume, but what is the use if it is not visible to the recruiters. Regularly update your profile online as the updated profile makes it easier for the recruiters to find you when they are looking for possible candidates. Another benefit is that the hiring managers may check you online, so it is another opportunity to impress him. 3. Video Resumes - Having a well-designed resume is the first step to success. And going an extra mile with the resume makes you a strong contender of the job. A video resume is the new technological advance in the recruitment industry and is fast catching the fancy of the recruiters and job seekers. So opt for the video resume instead of the plain text resumes and just grab your dream job. But if you are not a camera person and wish to stick to the text version, make sure that your resume is fine-tuned and perfect. 4. Networking - Networking plays a big part in job search Philippines. Successful networking is the new success mantra. Seeking help for the job could be a bit awkward for some of you, but believe me; networking is essential and sometimes the only effective way to get the job. So, spread out the word that you are currently undertaking job search Philippines. The more you do it, more quickly you will find a job. Reach out to your personal contacts family, friends, colleagues, classmates and acquaintances for any job leads and referrals. Social media is a huge platform to connect with like-minded people in your field. Another part of networking is to follow the companies you intend to work for. This will help in familiarizing your name and will build a connection with the managers there. And the hiring managers will certainly like to interview or even hire someone with a personal connection from the many qualified candidates. 5. Stay Organized - Staying organized is necessary while job hunting. When applying for many jobs at a time the overall situation can be chaotic if you do not keep a track of it. You should create a document where you can mention about the companies, positions you have applied and the dates when you have applied. Maintaining such records help you successfully follow up. 6. Be proactive - Being proactive is a must. If you just sit and wait for the job offers to come your way, you are in for a long wait. 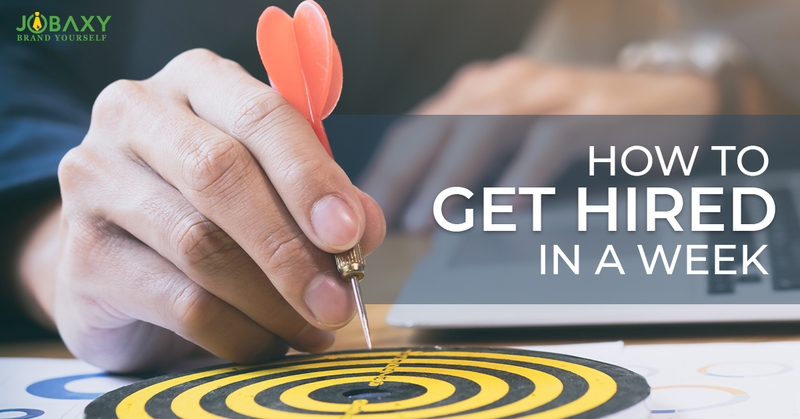 To get hired in a week, you need to be proactive. Maintain a record and use your tracking sheet to successfully follow up the job applications. If there is no response in 2 weeks of submitting the application, call the company to inquire. This will help to get your application out of the pile and onto the hiring manager’s desk. 7. Hire a Coach - Even after doing all things right you are not able to get through could be incredibly discouraging. Instead of being frustrated consider taking professional help. A career coach specializing in the job search strategy can provide a different approach. The coach will help you stay on track and optimistic. By following these steps you can surely achieve your goal of securing a dream job ASAP.